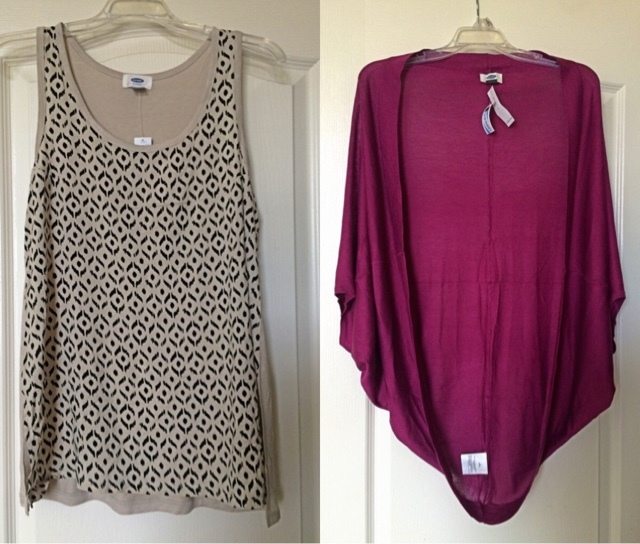 One of my favorite things about Labor Day weekend are all the sales! On top of all the sales, my birthday just happens to fall around Labor Day, so I always like to treat myself to a little shopping. That's just what I did this weekend. 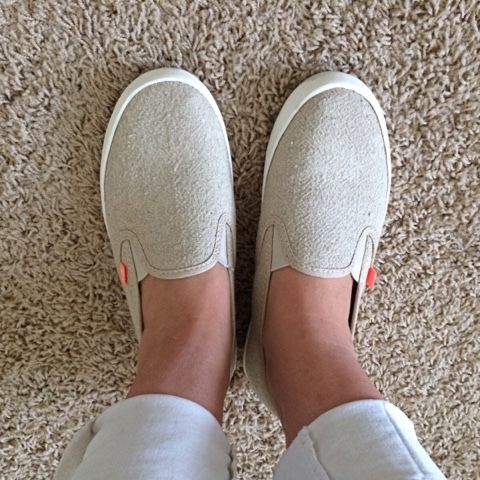 I've been searching for a casual pair of shoes to replace my favorite everyday pair of Toms for a while now. My Toms have been such a great pair of everyday shoes, unfortunately, they are so beat up, I have to retire them. Since I really didn't want to spend $50 on shoes right now, I decided to go to DSW in search of some casual shoes. I lucked out! I found these slip on Roxy shoes for 40% off $39.94. I had a coupon for $10 off and then another $5 off birthday coupon. My grand total for the shoes with tax came to $9.69. I was so excited! Even the girl who rang me up was impressed with my deal. After my DSW trip, I had to stop at Old Navy. They had everything on sale in the store, plus 30% off all clearance items. I ended up finding these 2 tops below. My favorite thing to do when I buy new clothes is to pair them with my old clothes and come up with new outfits. This top below was my favorite purchase. It was 50% off so it rang up $8.97. I paired it with jeans and a black blazer. 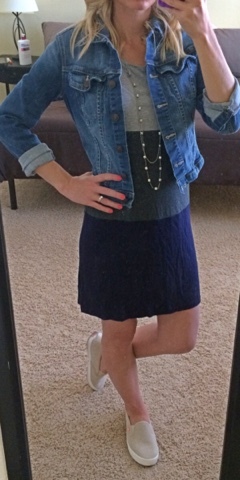 It's a cute look for fall. I felt that this magenta shrug will come in handing during my pregnancy. These always look cute on pregnant women. This was a clearance item. It was marked down to $10.99, but with the 30% off the total came to $7.69. 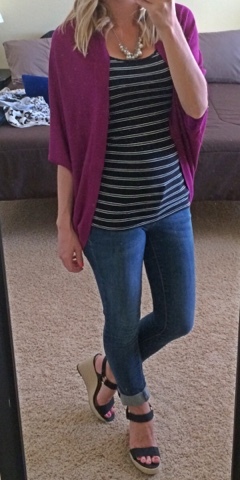 I tried out this shrug with some jeans and a striped tank top. The shoes I'm wearing are a shopping find worth mentioning. 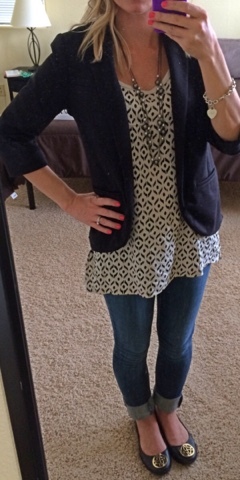 I found these strappy black wedge sandals at Target a few weeks ago on clearance for $8.49. I was able to get 20% off of that with my cartwheel app, making them only $6.79. Of course, no holiday weekend would be complete for me without stopping at a thrift store. I went to my favorite thrift store, Savers, and found some cute clothes. Everything was 50% off. 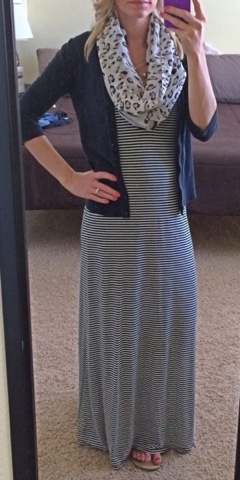 I love this striped maxi dress. If you haven't noticed, I love stripes. 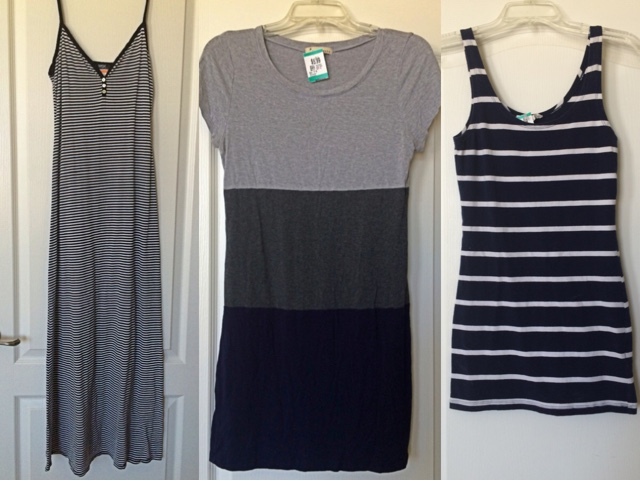 So what's one more striped dress in my closet? Buying a maxi dress used is a great idea for me, because it actually fits and it's not dragging on the grown. I always have to wash my maxi dresses about 10 times before they become an acceptable length for me. I paired the dress with a leopard infinity scarf and black sweater to give it a cute fall look. The dress was $4. This t-shirt dress is super comfortable and casual. It was $3. I paired it with my new shoes and my jean jacket. 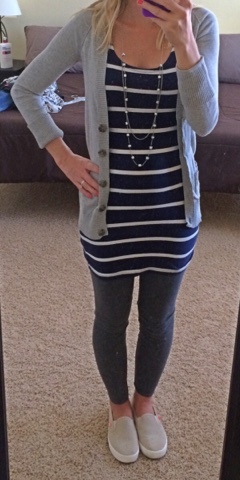 Continuing with my striped obsession, I found this long navy and white striped tank top for $2. I thought that it would be too tight at first but there's plenty of stretching room in the tummy. I paired this one with grey leggings, my new shoes and a grey long cardigan. I figured that this would make a great outfit for work. 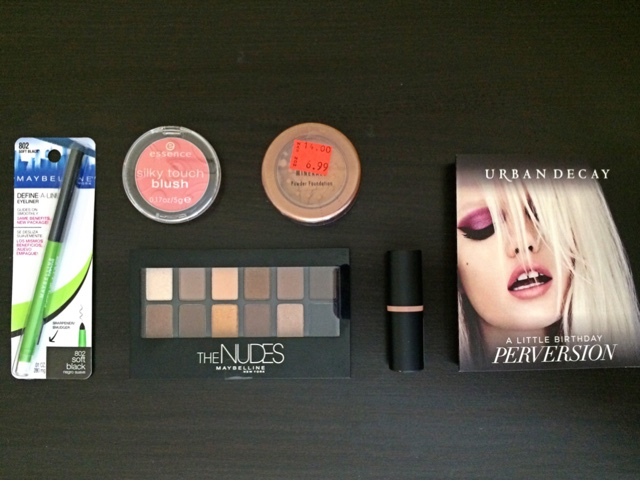 Maybeline eyeliner, Maybeline's The Nudes eye shadow palate, essence blush, essence lip stick, Ulta mineral powder foundation and a free urban decay mascara sample. My total was $18.87. The total of all my shopping purchases for the weekend ended up coming to $56.27. That's really not bad if you consider everything I bought. I love shopping. Nothing puts a bigger smile on my face than a successful shopping trip, knowing that I saved a lot of money. Now I have to stop spending money for the rest of the month. We'll see how I do with that.